Meridia is a Daedric Prince. She will speak to you should you happen to find Meridia's Beacon while exploring a dungeon or by going to her shrine, which will start the quest The Break of Dawn. For more information, see the lore article. Meridia seeks for her temple to be restored and after the beacon is returned, will send you to defeat Malkoran in Kilkreath Ruins. If you find Meridia's Beacon by chance, her voice will speak to you, "A new hand touches the beacon. Listen. Hear me and obey. A foul darkness has seeped into my temple. A darkness that you will destroy. Return my beacon to Mount Kilkreath. And I will make you the instrument of my cleansing light." If you find her shrine first, her dialogue will be slightly different, "A new supplicant approaches. Listen. Hear me and obey. A foul darkness has seeped into my temple. A darkness that you will destroy. But first, you must restore to me my beacon. I shall guide you unto it. Find it and return here. And great shall be your reward." Her voice will speak to you again when you find her beacon: "You have found my beacon. But it is not time for rejoicing. The defiler continues to profane my temple. Return to my figure on Mount Kilkreath, and I shall make you the instrument of my cleansing light." Upon going to Meridia's statue with the beacon, she will tell you about her temple's condition: "Look at my temple, lying in ruins. So much for the constancy of mortals, their crafts and their hearts. If they love me not, how can my love reach them?" When you place the beacon into her shrine, you will be transported to a point high above Skyrim. 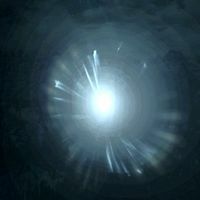 Meridia will appear as a sphere of light, saying, "It is time for my splendor to return to Skyrim. But the token of my truth lies buried in the ruins of my once great temple, now tainted by a profane darkness skittering within." She will then approach you and explain the problem: "The Necromancer Malkoran defiles my shrine with vile corruptions, trapping lost souls left in the wake of this war to do his bidding. Worse still, he uses the power stored within my own token to fuel his foul deeds. I have brought you here, mortal, to be my champion. You will enter my temple, retrieve my artifact, and destroy the defiler. Guide my light through the temple to open the inner sanctum and destroy the defiler." You may inquire about the artifact itself, and Meridia will reply with, "Mortals call it Dawnbreaker, for it was forged in a holy light that breaks upon my foes, burning away corruption and false life. You will enter my shrine, destroy Malkoran, and retrieve this mighty blade." Remarking that it doesn't sound like you have a choice in the matter will cause her to say, "But a single candle can banish the darkness of the entire Void. If not you, then someone else. My beacon is sure to attract a worthy soul." before giving you a friendly warning: "But if you are wise, you will heed my bidding." Alternatively, if you simply say you will do it, Meridia will reply with, "Of course you will. I have commanded it!" If you abruptly exit conversation before letting her finish, she will command you, "Go now, the artifact must be reclaimed and Malkoran destroyed." Either way, she will tell you, "Malkoran has forced the doors shut. But this is my temple, and it responds to my decree. I will send down a ray of light. Guide this light through my temple and its doors will open." No matter which dialogue you choose, you will be returned to the ground to go through the temple and defeat Malkoran. After defeating Malkoran, her disembodied voice will comment on his death, "It is done. The defiler is defeated. Take Dawnbreaker from its pedestal." 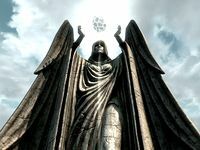 As you activate Dawnbreaker's pedestal, Meridia will teleport you out of the temple and approach you again, stating, "Malkoran is vanquished. Skyrim's dead shall remain at rest. This is as it should be. This is because of you. A new day is dawning. And you shall be its herald. Take the mighty Dawnbreaker and with it purge corruption from the dark corners of the world. Wield it in my name, that my influence may grow." At this point, if you say that you'll keep the sword but refuse to spread her religion, she will be dismissive, replying with, "It matters not. The plant cares nothing for the rays that bring it the warmth of the sun. As you carry Dawnbreaker, so will my light touch the world." If you state that you'll wield Dawnbreaker in her name, she will wish you, "May the light of certitude guide your efforts." Whichever your reply, she will reward you with Dawnbreaker and return you to the ground, completing the quest. This page was last modified on 3 September 2015, at 11:38.